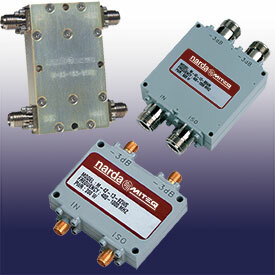 L3 Narda-MITEQ designs and manufactures a full line of 90° and 180° hybrid couplers that operate to 1000 watts CW and frequency ranges from 50 MHz to 4 GHz. We offer hybrid coupler designs in both octave and multi-octave designs with low insertion loss, low VSWR and high isolation. Other features include drop-in, caseless and coaxial models, rugged packaging and all of our couplers comply with MIL-P-23971. 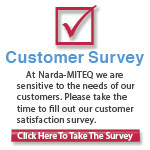 In addition to these standard products, much of L3 Narda-MITEQ's Passive Power Component Department's production is devoted to custom designs. For variations on catalog performance or optimizing key parameters such as frequency range, insertion loss, power and VSWR, to meet your specific requirements, please contact the factory for assistance. These advanced passive component solutions are backed by L3 Narda-MITEQ's 3-Year Warranty and most are available as RoHs Compliant components.